Preheat oven to 350°F. Line 2 baking sheets with parchment paper or a silpat. Combine walnuts, oats, raisins and cranberries in a food processor and pulse until finely ground. Transfer to a bowl and stir in flour, baking powder, cinnamon and ginger. Add carrots, apple, banana and almond milk and stir until combined. Drop by rounded tablespoons an inch apart on the prepared baking sheets, making about 24 cookies. Press down on each cookie with the back of a fork to flatten slightly. Bake until tops and bottoms are lightly browned, 20 to 25 minutes. Hi I’m newish to vegan cooking I’ve been using vegetarian recipes for years. I can’t wait to try different types of recipes. Does anyone know how almond meal or a combination of almond meal and coconut flour could be substituted for the whole wheat? ^^whoops, that was without the walnuts….walnuts add another 800 which is 2000 total as said above. Sorry for the waste of space. I will be making them without the walnuts because nuts are sooo good but sooo many calories. Calories are approx. 1200 total recipe, which is 50 per cookie based on 24. Going to try these out for sure once I track down a stage 7 banana. 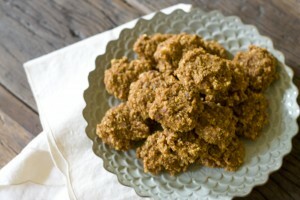 These cookies are great…I can’t wait for my husband to try them when he gets home! I made them just like the recipe; I did have to bake them for 30 min., but I live at 5000 ft. Altitude. We can have cookies for breakfast & still be eating healthy! I am not vegan but am trying to cut out sugar. I despise artificial sweeteners. These sound absolutely perfect! Thanx! I added 1/2 cup pumpkin and 1/2 c oats at the end. They were very good. you can use quinoa flour or spelt flour. i used spelt flakes instead of oats and spelt flour instead of whole wheat flour and it turned out perfect. Just tried this for the first time, didnt have almond milk but used cocnut milk instead and used goji berries instead of cranberrries. YUM YUM YUM. even my non vegan friends and sweettoothers loved them. Can you provide a substitute for the wheat? I’m so sorry but I don’t know the calorie count. Can you tell me the calorie count in the cookies? I am looking dairy free baked good recipes. Thanks!! Left out the almond milk (ran out), added allspice and nutmeg, doubled the cinnamon, and added ~2 tbs of raw flaxseed. Cooked for 15min They were perfect. They would be a recent meal replacement bar for non vegans too. you could try another nut or flax seeds to replace the walnuts. Need to leave out the 1 cup walnuts. What would be a good replacement for that to keep the texture and flavor of the cookies? I have not tried the recipe, or tried it with pumpkin, but yes maybe less would be a good idea. Also, I think shredded zucchini would be good. Like a zucchini bread? I’m just throwing ideas out for experimenting. I’m going to try making these though, they look awesome! I have yet to try a pumpkin version but I would use much less since the pumpkin is more moist than carrot. As many have already indicated, I too am new to vegan cooking. In this recipe, how much pumpkin would you use in place of the carrot? Thanks for all the great recipes and helpful information. I thought these were great! Nice and soft! Tasty! Will definately make again, I think I will try them with canned pumpkin too. I would guess you could use canned pumpkin too. Would be worth a try and would taste nice with the flavors in the cookie. I can’t wait to make these! You could try an overripe pear. You might also add some ground flax seeds to make sure the cookies bind together. Bananas usually help with that. Let us know how they turn out! My mother and sister do not like bananas. Any suggestions for a substitution in baking?